Arguably the most consistent label in the game, Local Talk had quite the year in 2017. In fact, DJs and promoters Mad Mats and Tooli were responsible for coming out with some of my favorite releases of the year. From Marcel Lune’s “Astral Palms,” to Crackazat’s “Rainbow Fantasia,” one could argue that no label has been more prolific than Local Talk in recent months. However, this is what we’ve come to expect from the funkmeisters from Sweden. 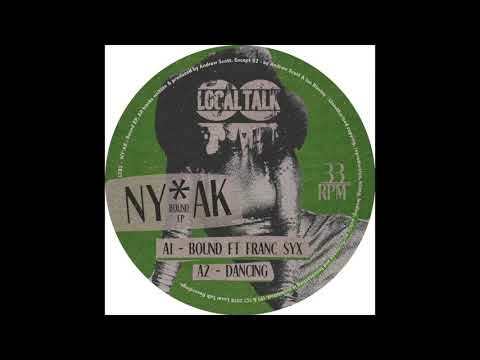 Not taking any time to catch their breath, Local Talk are kicking off 2018 with a bang with a fresh, disco-centric EP titled “Bound.” This one comes from Andrew Scott, who goes by the name NY*AK. For those that don’t know what “NY*AK” stands for, don’t worry about it. It has nothing to do with New York, Alaska, AK-47s, or when a sustained pedal should be lifted. Andrew simply banged his computer keyboard in frustration one day, and those are the letters his keyboard spit out. Yup, that’s it. Despite that, this should not give you the impression that his music is as haphazard as the manner in which he chose his name. Just take a look at his title track “Bound.” Leading off with an inviting sequence of disco loops, Andrew spends the majority of his time gradually building up the momentum of the song until it releases itself around the 5 minute mark; opening up space for the seductive vocals. If I had to compare this sensation to a physical experience, I’d say it’s like those times when you arrive late to a jam-packed concert. Eager to get to the front, you and a friend decide to force your way to center stage. But in this particular instance, your friend is NY*AK and he’s taking you up close to the promise-land where you get to listen to Franc Syn’s vocals in all their glory! To get your spot near the front of the stage, you can buy NY*AK’s “Bound” by clicking this link right here!